Rory is a cake decorator who gets taken by a demon into the land of Palladino, where ghosts and gargoyles and other creatures live. She is forced to train to be graceful and proper so that she can be auctioned off to a ghost lord. While she goes along with the training in order to survive, she secretly plots to escape Palladino even though she has been told it is impossible. There were a lot of things I didn’t like about this book but there were also some things that I did. I felt like there really wasn’t enough character development–Rory is thrown into this situation pretty early on in the book and I felt like I couldn’t develop a connection to her character at all. There are flashbacks with random characters thrown in that don’t really make sense–there are two flashbacks with a neighbor boy that she had a crush on but other than that his character has nothing to do with the rest of the story so it seem forced and out of place. Also, Rory’s mother constantly warns her about demons and being out after dark, yet we never find out how her mom even knew about these creatures or why she would suspect that they would come after Rory. The world building was something that I did like–Cho creates a very vivid world filled with castles and hot air balloons and an array of ghost and creatures. The whole ghost ballerina thing was kind of strange, and I really didn’t get the purpose of the girls having lessons on posture and how to hold a fan when supposedly the ghost lords only want them for their memories, but the whole concept of the story was a very original idea. Overall, Rory was a bit of a strange book that was lacking in some areas but had great world building and an original story. While it was not really for me, I’m sure others may enjoy it more. 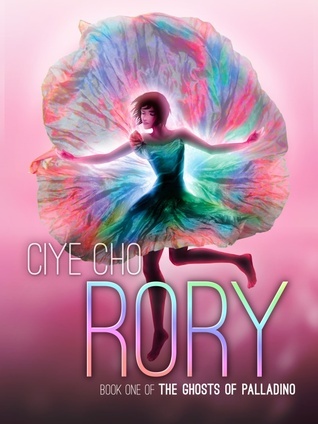 Rory was released on August 10, 2013 and is the first book in The Ghosts of Palladino series.